King George V was born George Frederick Ernest Albert of the House of Saxe-Coburg-Gotha on June 3, 1865. His grandmother, Queen Victoria, was the reigning British monarch. His parents were Albert Edward, the Prince of Wales and Alexandra of Denmark, the Princess of Wales. With his grandmother having such a long reign, it would be another 36 years, after his birth, before his father ascended to the throne as King Edward VII. And, George had an older brother, Albert, who was next in the line of succession. Thus, during most of his life, George was never expected to be a future king. Prince George, as well as his brother Albert, did not perform very well in their scholastic studies. Their father decided that their best opportunity for training might be the military, so they both joined the Royal Navy in 1877, serving until 1891, during which time the two brothers toured much of the British Empire. It was during this time that Prince George developed his love of the sea and of sailing that would last the rest of his life. 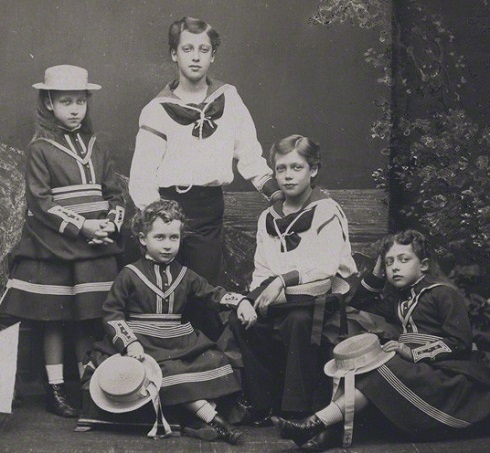 On January 14, 1892, Prince Albert, George's older brother, died of Pneumonia. All of a sudden, Prince George, after his father, was next in the line of succession! Following his brother's death, Prince George was created the Duke of York by Queen Victoria on May 24, 1892. On July 6, 1893, Prince George married Princess Victoria Mary of Teck at the Royal Chapel in St. James Palace in London. They were devoted to each other for the remainder of their lives. By his own admission, Prince George was unable to express his feelings in speech, so they often exchanged love letters and notes of endearment. Upon their marriage, Victoria Mary immediately became Princess Mary, the Duchess of York. On January 22, 1901, after a reign of 64 years, Queen Victoria died. Prince Albert Edward, the Prince of Wales, was proclaimed King Edward VII. On November 9, 1901, Prince George and Princess Mary were created the Prince and Princess of Wales. All of a sudden, Prince George was heir to the throne! Edward VII was an effective king. He was known as "Edward the Peacemaker", and the period of his reign has been called "The Edwardian Age". Edward's health had never been very good though, even as a young prince. He was 60 years old, when he came to the throne, and throughout his short reign, his health worsened. In April 1910, the king came down with a severe case of bronchitis, but he refused to take time off to rest. On May 6, 1910, the king had several heart attacks, but he insisted on going on with his royal duties. That evening, he died in his sleep. 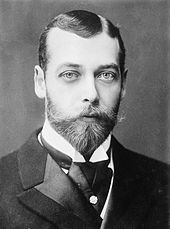 At 11:45 PM on May 6, 1910, Prince George was proclaimed King George V. Prince George wrote in his diary, "I have lost my best friend and the best of fathers ... I never had a cross word with him in my life. I am heart-broken and overwhelmed with grief, but God will help me in my responsibilities, and darling Mary will be my comfort, as she has always been. May God give me strength and guidance in the heavy task which has fallen on me." With George's wife's name actually being Victoria Mary of Teck, he thought it highly inappropriate for her to be called "Queen Victoria", so the two of them agreed that she should be called "Queen Mary". 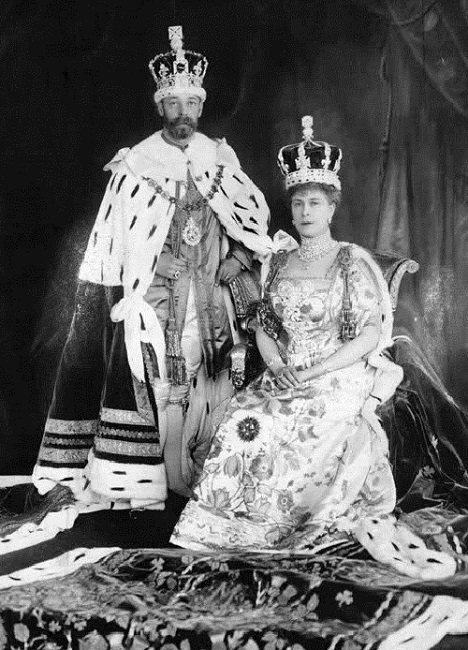 On June 22, 1911, King George V and Queen Mary were coronated at Westminster Abbey. Three years into the reign of King George V, World War I began. At this time, most of the royal families of Europe were descended from the children of Queen Victoria, and many of the crowned heads of Europe, in 1914, were directly related to the king, including the Kaiser of Germany and the Tzar of Russia. Though George was English in every respect, he and his royal relatives were all descendants of German royal houses, and their royal titles used German family names. During World War I, anti-German sentiments in Britain were very high, and much of the anti-German anger was focused on the royal family. H. G. Wells, at the time, described them as Britain's "alien and uninspiring court". Upon hearing this, King George V retorted, "I may be uninspiring, but I'll be damned if I'm an alien". On July 17, 1917, King George issued a royal proclamation changing the name of the royal family from "the House of Saxe-Coberg-Gotha" to "the House of Windsor", taking the name of the nearby castle that had stood as a monument to British royalty for over 800 years. His British royal relatives relinquished their Germanic titles and replaced them with British-sounding surnames. German relatives of the royal family were disowned and their British peerages, if any, were dissolved. By the end of World War I, most of the monarchies of Europe had vanished, having been replaced by democratic or socialist republics. The King and his leading advisers were concerned about the rise of socialism and the growing labor movement in Britain, which they associated with republicanism. Their concerns resulted in a redesign of the monarchy's social role, to be more inclusive of the working class and their representatives. The king also cultivated better relations with moderate Labor Party officials and the labor unions. His abandonment of social aloofness enhanced the popularity of the royal family during the difficult economic times of the 1920's and in the aftermath of the Great Depression. By the time of his Silver Jubilee in 1935, King George V had become a well-loved monarch, saying in response to the adulation, "I can not understand it, after all, I am a very ordinary sort of fellow". By the end of 1935, the king's health was failing. On January 15, 1936, the king took to his bed, complaining of a cold. He never again left his bedroom. Drifting in and out of consciousness, the king finally died on the evening of January 20, 1936. He was succeeded by his oldest son, Edward, the Prince of Wales, who became King Edward VIII. 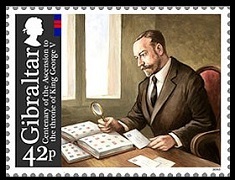 King George V was one of the most notable philatelists of his day. In 1893, as the Duke of York, he was elected Honorary Vice President of the Royal Philatelic Society. They presented him with an album, containing about 1,500 stamps, as a wedding present. He is personally responsible for building the Royal Philatelic Collection into what it is today. He expanded the Royal Collection with the purchases of a number of high-priced stamps and covers. In 1904, he purchased the Mauritius POST OFFICE 2 P. Blue for £1,450, a record price at the time for a single stamp. A courtier asked the prince if he had seen "that some damned fool had paid as much as £1,450 for a single stamp". George replied, "Yes, I am that damned fool". The Mauritius stamp (Scott #2) that King George bought for the equivalent of US $6,000 at the time, has a catalog value of US $1,250,000 in the 2016 Scott Postage Stamp Catalog! The collection of King George V was housed in 328 "Red Albums", each containing 60 pages. A set of "Blue Albums" was added for the reign of King George VI, and a set of "Green Albums" was added for the reign of Queen Elizabeth II. The collection is kept at St. James Palace in London, and parts of it are occasionally exhibited by the Royal Philatelic Society at international exhibitions.